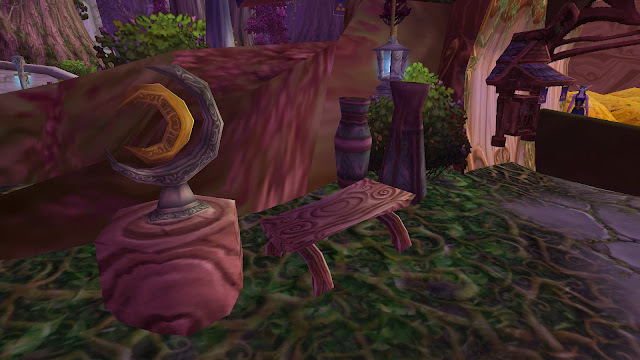 The tauren dropped a sheaf of papers on the orc's desk, where she sat inspecting the seams of a junior leatherworker's practice tunic. Her eyes flicked to the papers, then to her companion's face. "The patterns for that Cenarion Circle request are in," he said by way of explanation. The orc unrolled the documents with interest. She was silent for a few minutes while she shuffled back and forth between the proposed designs. The tauren moved to look over her shoulder. "This one here isn't bad," she said, choosing one of the designs from the pile. The tauren grinned. "That one was my favorite, too." The orc ran her finger down the list of specifications contemplatively. "Of course it would have to be feathers," she muttered. "Well, it is for a flying contingent." "Yes, the Cenarion Circle Regiment of Emissaries and Messengers. That name will never stick." She stood and headed for the back room, where there was a compendium of materials for traditional druid leathers. The tauren trailed after her. "I expected them to call it a "flock" or something, seeing as it's for flying druids..." He was rewarded with an appreciative laugh. 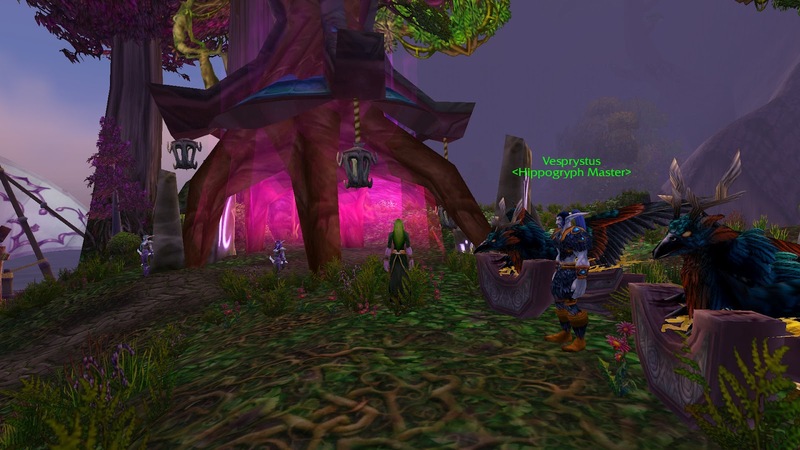 The orc flipped through the encyclopedia detailing the different types of birds and feathers available to them. She checked two references, jotted down some information on a small notepad she kept on her belt, and rifled around for some blank parchment and a quill. "As I suspected, the only feathers really appropriate for this kind of design are protected by the Circle. We'll have to apply for access to them." The tauren nodded. "It always works out like that. You'd think they would just bring us the permits already filled out!" "That," she replied sarcastically, "would not be the proper bureaucratic method." She set up the model form along with a blank sheet of parchment and writing utensils on the desk in the corner. "You write it; your handwriting is better than mine." He took the quill from her without complaint and began to copy the oft-used application. While he wrote, the orc hunted in the desk drawers for their leatherworkers' guild seal. 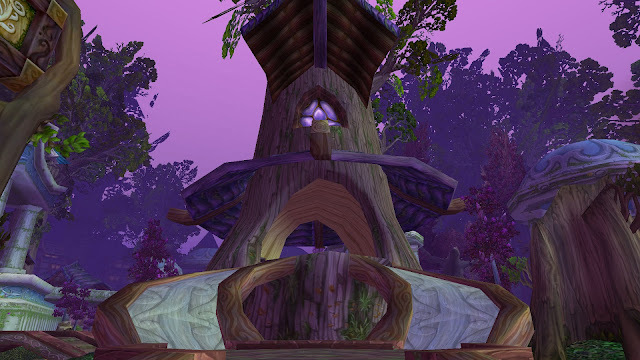 "Kodohide Leatherworkers formally requests access to Frayfeather Hippogryphs, currently under protection of the Cenarion Circle. Materials harvested include but are not limited to feathers, hide, talons, beaks. 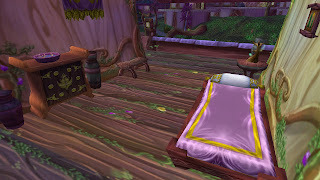 Said materials will be used solely in construction of Cenarion gear as per details outlined in Regiment of Emissaries and Messengers Uniform Update commissioned by..." The tauren looked around for the original request form. "Ah yes, Hadakha Treewalker, of the Cenarion Circle. Kodohide Leatherworkers vows to treat all beast sacrifices with the greatest of care and respect as outlined in the Approaching Nature handbook." He re-inked the quill and filled in the details and specifications of the gear design and the expected hippogryph toll. Then, below the typical druid greeting, he penned his and the orc's names. After he signed his name, the orc signed hers, cast drying powder over the parchment, and folded the document into the envelope she had prepared. Then, she dripped a blob of melted wax onto the envelope and stamped it with their official seal. The wait wasn't long. 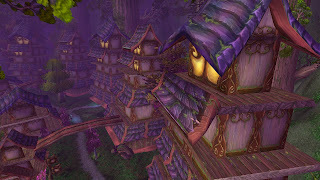 In as much time as it took for a carrier pigeon to wing its way to the Moonglade and back, the orc was opening a document proclaiming "This permit hereby authorizes Kodohide Leatherworkers access to Frayfeather Hippogryphs for use in Cenarion Circle leathers as detailed in the aforementioned commission until such time as the armor request has been fulfilled." It was signed and sealed by the Archdruid in charge of the Cenarion Armory. 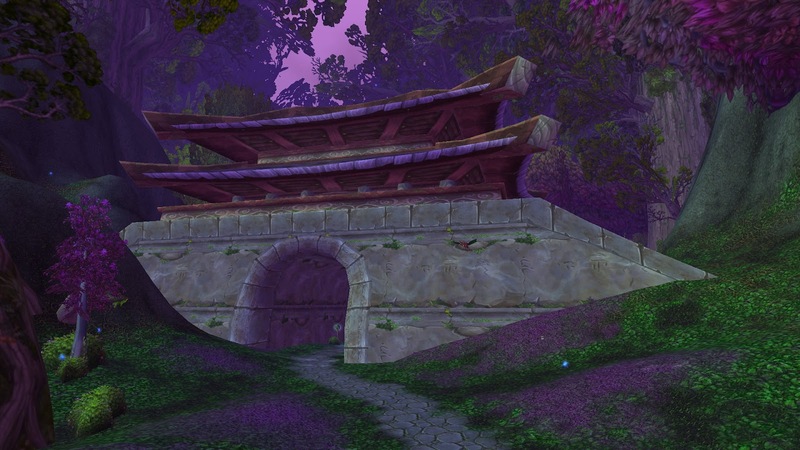 Not long after, the leatherworkers were hacking their way through the thick undergrowth of Feralas, permit tucked safely in their bags. 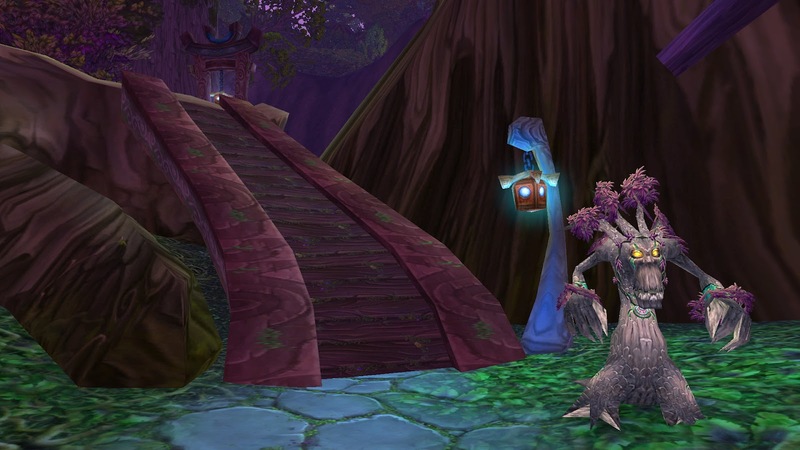 They had spent the past few days hunting hippogryphs and were nearing their quota for materials. "I'm just saying, maybe they're going extinct because they walk into traps so easily," the tauren mused, disentangling a limp body from the final trap they had set. The orc snorted and began to truss the body for transport back to their camp where the rest of the carcasses were stored. "Maybe being protected and without predators for so long has made them evolve to be less vigilant," the orc suggested. She brushed sweat from her eyes and wiped it on her leggings. 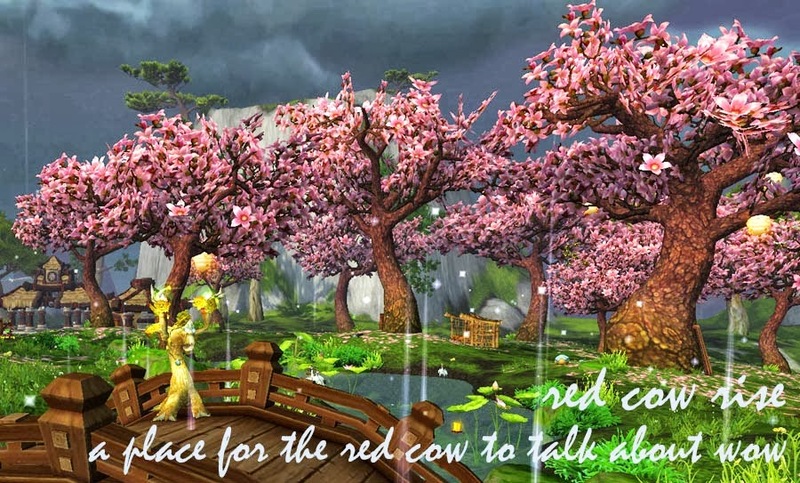 The tauren hummed. "I don't think evolution happens that quickly..." He was interrupted by a sudden screech and flurry of wings, and in the next instant was toppled over by an enormous stormcrow furiously scrabbling at his eyes. 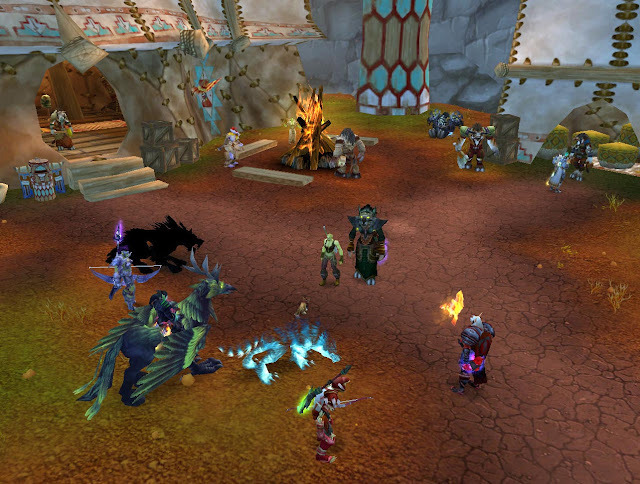 With a startled shout, the tauren managed to thrust the bird away from him. Snarling, the orc was already rushing towards her companion, blood pounding in her ears and axe raised in a charge. A sudden flash of moonfire blinded her, and when the spots in her vision cleared, a dire bear was advancing on the tauren. She immediately dropped her axe and clawed at the armband on her wrist. "Wait! Stop!" she shouted, waving the armband. The embroidery depicted the Cenarion Circle's crest and should have identified her as a Circle delegate to any experienced druid. The dire bear ignored her, charging the tauren and swatting him with a mighty paw that made even him look small. He flew through the air, sliding to a stop against a moss-covered rock. In battle, a comrade falling was something that simply couldn't be helped. The grunt charging beside you might collapse with an arrow through his eye, the commander next to you might be dragged off her worg with a polearm. A trained warrior simply kept fighting until the battle was finished and there was time to attend the injured and dying. Not so in this case. The orc felt the all-consuming bloodlust claw up her throat. Scooping up her axe, she placed herself between the druid and the tauren and struggled to dredge up the few words of Darnassian she knew. "Druid!" she bellowed, brandishing the armband alongside her weapon. "Cenarion! Leather!" 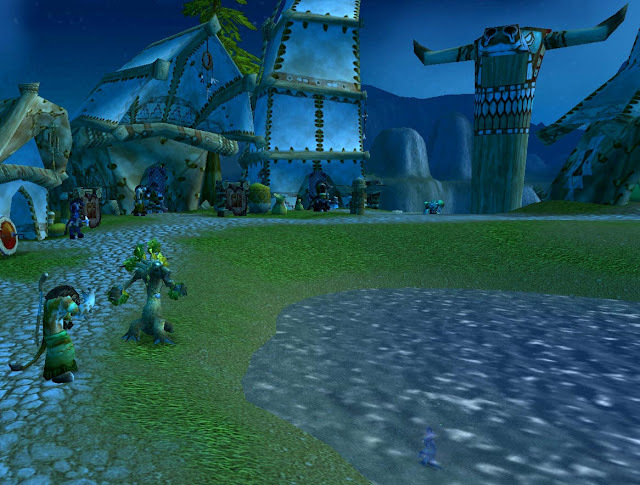 With a gasp, the dire bear shimmered into a willowy night elf wearing a Cenarion Circle patrol tabard. He held up his hands in defense. "I'm sorry, I'm so sorry, I didn't see, I thought you were," he stammered in Common. The orc barely heard him over the roaring in her head and the uncontrollable snarls coming from her mouth. "Heal! Help!" she shouted, gesturing to the still form of her partner. 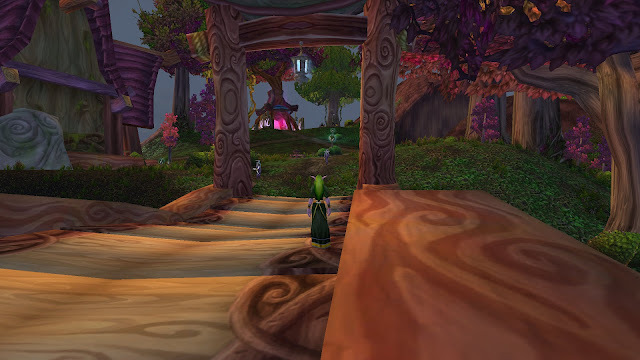 The druid began nodding, eyes massive. "Yes, of course, I'll bring help-"
The orc charged, fangs bared, "RUN!" With a squeak, the druid took flight, narrowly missing the swing of her axe. As he swooped away through the treetops, her enraged howl followed him. Now alone in the woods, the orc threw her weapon down, cleaving deep into the soil. Still quivering with bloodlust, she stalked to the nearest boulder, hefted it to her shoulder with a grunt, and heaved it as hard as she could. It sailed through the underbrush, leaving a damp trail of crushed plants. The orc screamed at its wake. Feeling slightly calmer, she turned and rushed to her fallen companion's side. With steady fingers she pressed a clean handkerchief to the oozing wound marring his face. He smelled singed where the moonfire had struck his mane. There were long gouges around his eyes, and blood matted his head and shoulders. The orc said nothing, simply keeping pressure on the wound and gently feeling for broken bones. All she could do was wait. 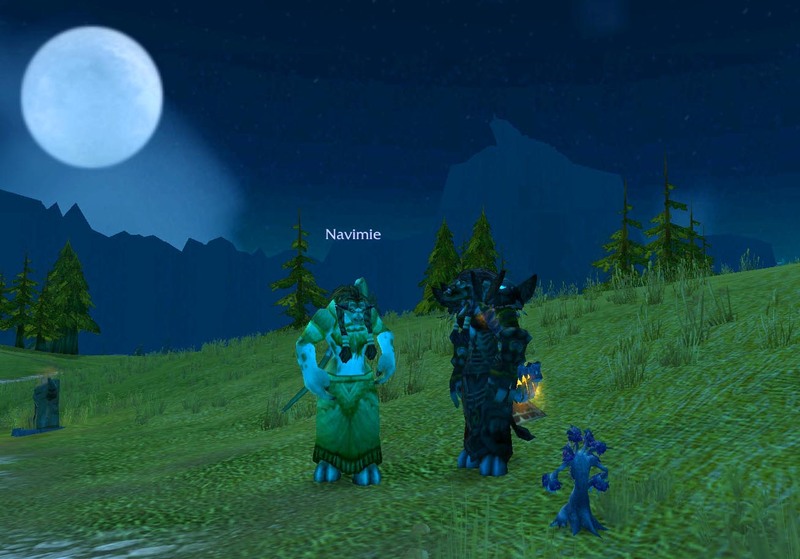 So you may have noticed that Navimie is going around Azeroth and hunting down her favorite bloggers! Don't worry, she just wants to shoot you....r picture! 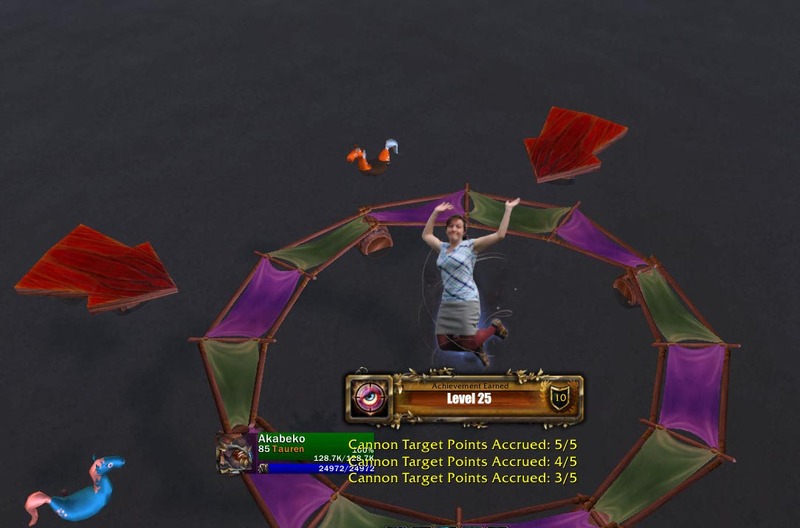 Tonight, she caught me as I was doing my daily Anzu slaughter and we met in Mulgore. We moved the party to Thunderbluff. The atmosphere is so nice with the little pond, don't you think? Then it was time to visit her server! Secretly, I had rolled the orc and tauren leatherworkers on her server when I needed their screenshots for the Noblegarden post. I was so surprised to see not only her, but her guildies waiting for me as well! They were all very friendly, and so fashionable! I've never seen so many well-dressed guildies in one place before! It was weirdly awesome to see all the names and faces that Navi talks about in her posts :D Plus, Aza said good things about my writing so consider my epeen STROKED! Thanks guys! Frostwolves howl awooooooooo! Mists of Pandaria has a release date! Zomg you guys! It's September 25th! Quick, go throw your money at Blizzard because I certainly am! I'm eagerly awaiting learning the difference between the Digital Deluxe Edition and the Collector's Edition. Mysteriously, no battle.net pages have successfully loaded for me for the past week or so. OH WELL I have 2 whole months to make my decision, eh? I think this is my cue to uninstall the Mists beta and prepare the welcome wagon for all the incoming panda cuties! Ok whatever you guys certainly don't come here for news let's get to the GIFS! I'm putting most of them behind a cut because, well, you'll see. It is apparently more common than you think! A while ago, for shits and giggles, I wrote a little snippet so ridiculous I seriously considered whether or not I wanted it to become part of Akabeko's actual "story" (in as much as she has one). But it made me laugh and was a second little jab at Dubenko (may he never rest in peace) so I published it because let's face it, I was low on post ideas. And THEN I was alerted to something amazing, something fantastic, something too wonderful to behold...!! Kamalia painted an incredible picture of the final scene! 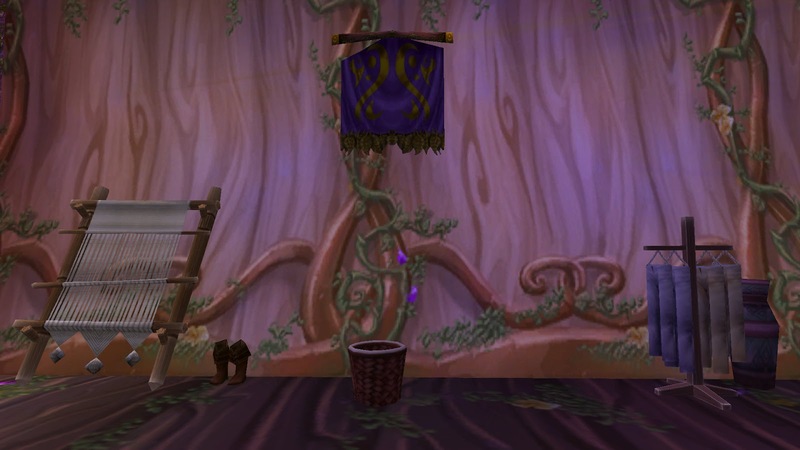 She even looked up the characters on the armory to reproduce their gear! THANK YOU THANK YOU THANK YOU THANK YOU THANK YOU!!!!!! I am making this post under duress from Navi and Kamalia, I swear! 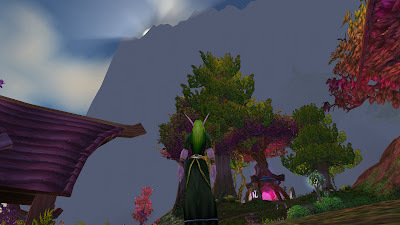 So a while ago I saw a writing competition being advertised on the twitters calling for writers to submit their stories about WoW. Since I have been known to do that kind of thing I submitted three stories (there was no limit) on what I thought was nearly the end of the competition. June 6th came and went and nothing changed on the competition page so I stupidly stopped checking back. Then, after July 6th I got a tweet from the illustrious Ironyca alerting me to the fact that the winners had been announced. I was one of them? Out of 74 entries, 8 were chosen to receive some fun prizes. 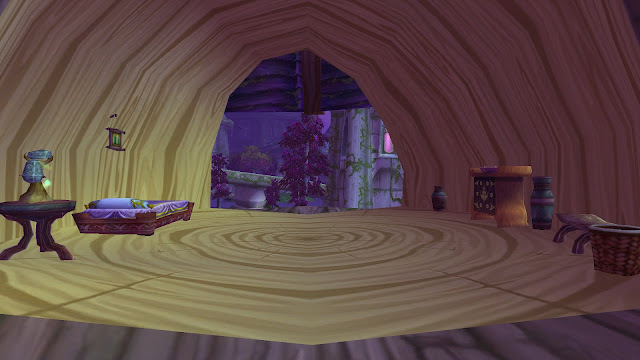 My story The Innkeeper's Daughter got second place, as illustrated by this incredible image made by WoW Roleplay Gear. LOOK YOU GUYS! It's Aka wearing silver plate!!! I highly recommend you take a moment to peruse all of the entries, because there were a lot of really great ones, including some by other bloggers you know and love! Only one race has the privilege of saying they live in a tree. Rising up out of the sea is the great tree Teldrassil, planted in an attempt to recreate the World Tree. In addition to the night elf starting area, the tree houses the capital city of the night elves. Friendly players will most likely approach from the sea, taking either a boat or hippogryph flight to the now-reclaimed Rut'theran Village. Teldrassil is little more than a looming shadow from this vantage point. 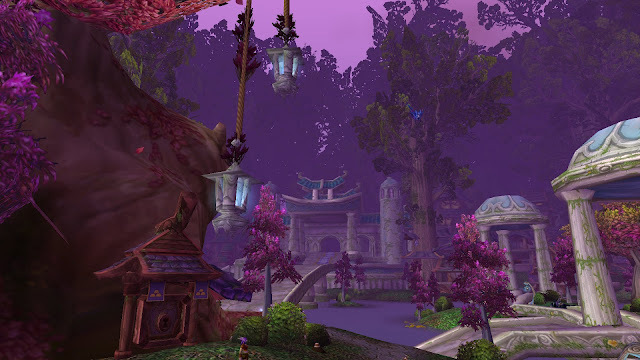 The only things to do on Rut'theran's island are take one of three boats or step through the glowing pink portal. 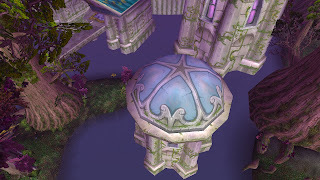 Once among the branches, the city of Darnassus is laid out in an open, circular pattern. Major quarters ring the edges, while the central bank is surrounded by a large lake. 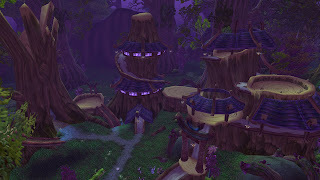 I'm not sure if the trees on Teldrassil count as trees or merely branches, but the night elves make the most of them by carving them into buildings. Just beside the city's portal is the flight master and quartermaster. Straight ahead is the tree housing the central bank, which is filled with piles and piles of gold behind an open window. 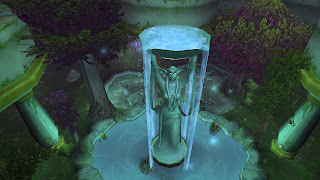 Going counter-clockwise from the portal will bring players to the Temple of the Moon, where the High Priestess Tyrande Whisperwind and her consort Arch-Druid Malfurion Stormrage hold court with diplomats and Sisters of Elune. This section draws on the Nordic-influenced elven architecture, with lots of lichen-covered towers and pillars. The white marble gives a cool solemnity to the religious center, and the few alcoves allude to quiet study by pious worshippers. 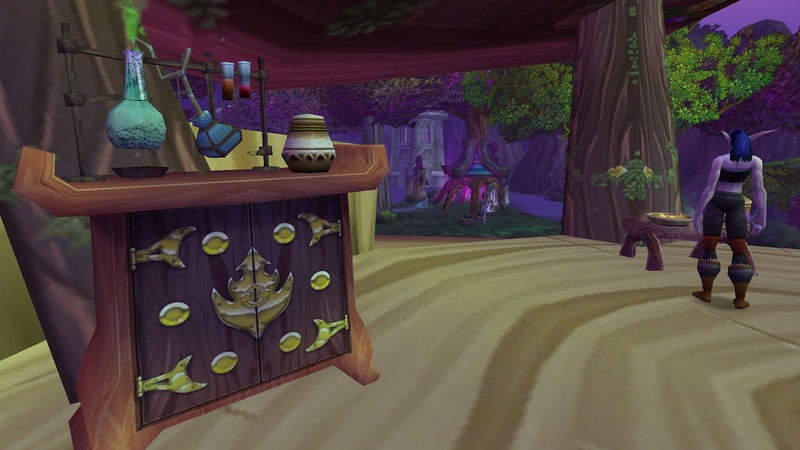 Continuing the circuit brings us to the Tradesmen's Terrace, which houses the city's auction house and several vendors. The buildings here are many-storied, wooden, and open in their construction. Many lack doors and only have enough walls to support the structure. 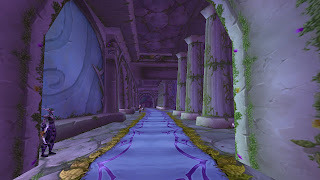 The pathways are packed dirt and lined with grass and purple-leaved trees. Even though it's a capital city I can't help but want to take my shoes off and go for a walk! 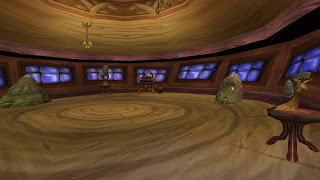 Happily, there are a few empty rooms that roleplayers could easily take up residence in. This section even features a barracks for the Sentinels! 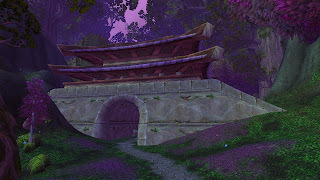 Skipping back through the Temple Gardens, taking advantage of the lovely stone bridges over the lake, we come to the Cenarion Enclave, my Ally home-away-from-home. 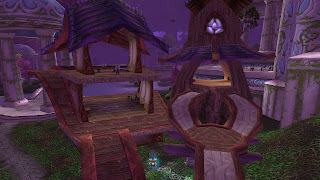 (What wouldn't I give for something like this in Thunderbluff?) The buildings are hollowed-out trees that house druid, hunter, and the elusive rogue trainers, and players can train their riding skill and purchase nightsaber mounts here. The top room in the druid section is conspicuously empty. 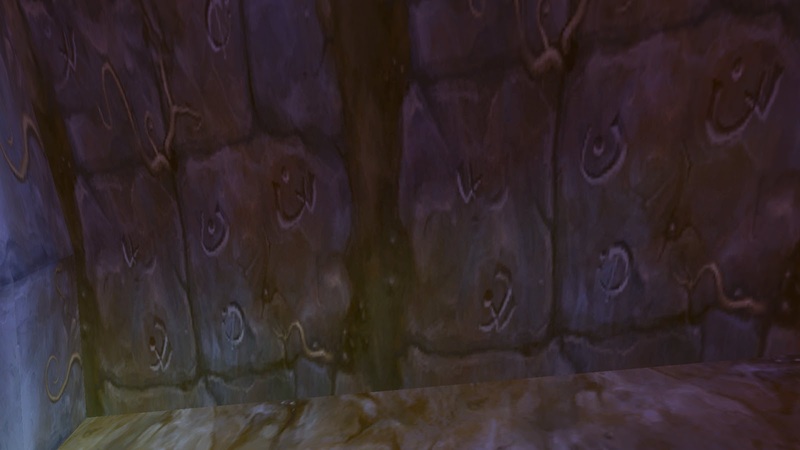 The walls leading to the underground rogue trainers have some interesting runes carved in them! 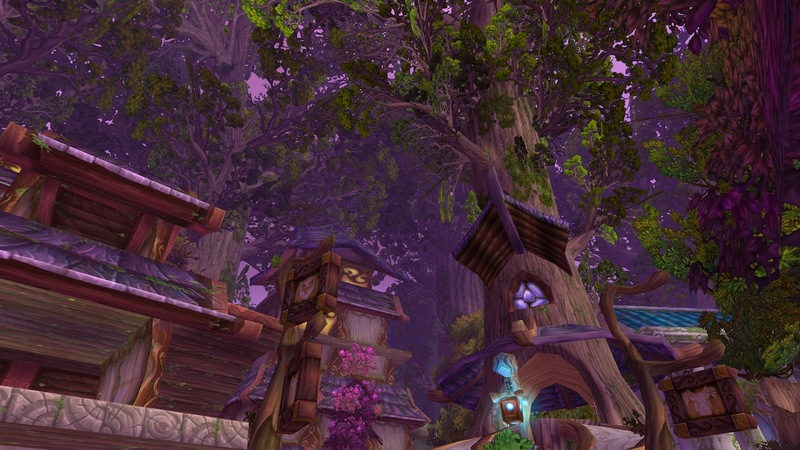 Northeast of the Enclave is a recent addition to the city: The Howling Oak. 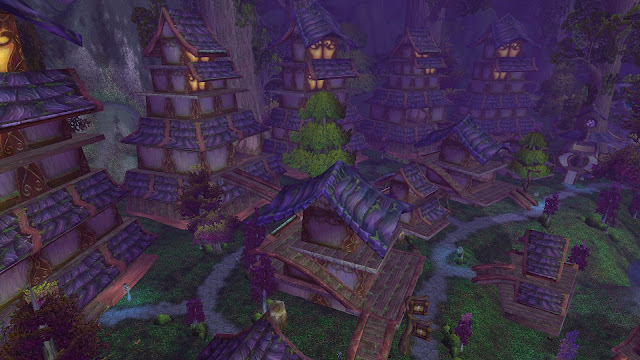 This is the sanctuary for the Gilnean worgen, and houses class trainers and refugees and not much else. The atmosphere itself is cool enough: the Oak is a "worgen tree" much like the massive Tal'doren in the worgen starting area. Mysteriously, there are no residences at all here. Southeast from the Enclave is the Craftsmen's Terrace, which holds the city's inn, the Argent Dawn ambassadors, and the city's profession trainers and vendors. Here are more wooden, open buildings, some of which contain creature comforts like beds and privacy screens, the answer to wall-less rooms. Along the outer edge are spectacular, five tiered buildings. When there was no flying in Azeroth, these were perfect, but now that I can fly up to peek in the frosted windows I would love to be able to fly right inside and move in! 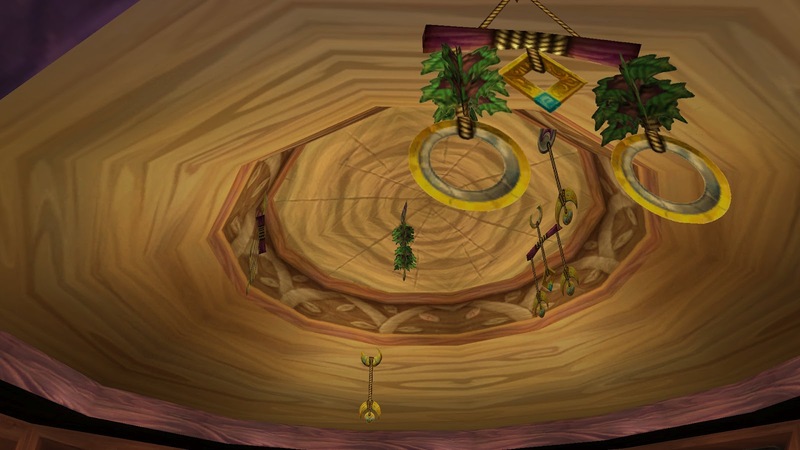 Last, but not least, is the Warrior's Terrace. This brings us back to the classic marble pillars and houses the warrior trainers and battlemasters tucked away in corners. Continuing east through the wide walkway will bring players once again onto soft grass. 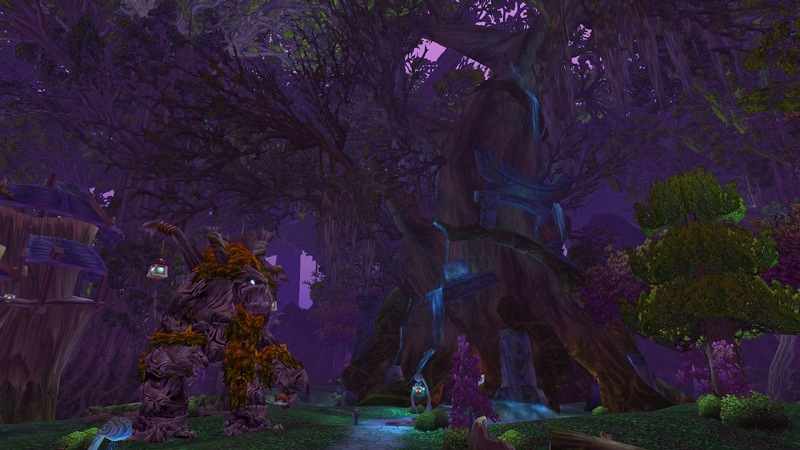 Heading past the wisps and ancients will bring you to Teldrassil proper. Darnassus has cool relaxation down to an art. You can see the serenity reflected in the open, guileless architecture and layout of the city and feel it in the always-shady, damp and mossy flora directly intwined with the buildings. There are a few locations in the city perfect for roleplayers to insinuate themselves into the daily life alongside the NPCs, which makes me very happy! 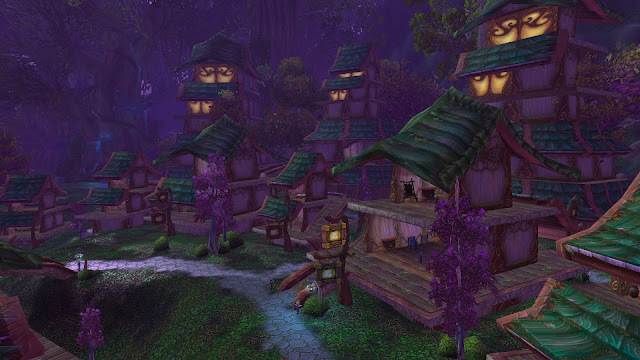 As much as I love my Hordies, gorgeous cities like this one make me wish I could visit them more regularly. 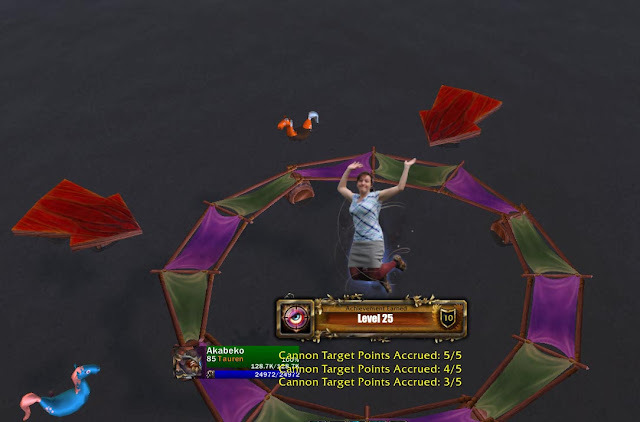 Congratulations, you have reached level 25! You have gained 200 cooking profession points. You have learned IDGAF (rank 3). Your Strength increases by 5 pushups. Your Intellect increases by a nominal amount. Your Spirit increases by enough to stare down angry office ladies and overly curious gym acquaintances. I'm sure there's a useful takeaway message in here somewhere.